WSA protests continued on Feb. 22, seeking to make the Assembly more representative of the student body. On Sunday, Feb. 22, the President of the Wesleyan Student Assembly (WSA) Grant Tanenbaum ’15 addressed the students who had gathered to discuss the possible reorganization of the student government. Tanenbaum was responding to a group of around 40 students who charged the WSA with being institutionally unsound and structured so that the voices of traditionally marginalized groups cannot be heard. This movement, called “Shut. It. Down.,” according to the event’s Facebook page, dovetailed with responses to a heated general assembly meeting on Feb. 15 that left first-generation students offended and in tears. 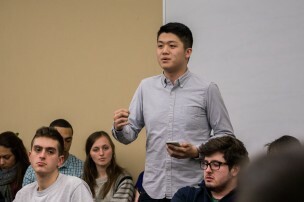 An article published by The Argus on Feb. 24 recounts developments relating specifically to that incident and its resolution; this article speaks to the other half of the Feb. 22 meeting and the movement that considers the WSA as an institution. Further points stipulate a broad framework for rewriting the constitution, safeguarding stability during transition, and ensuring that the new structure reflects principles of inclusion and diversity. In a gathering prior to the WSA General Assembly (GA) meeting on Feb. 22, McCutchen spoke to supporters of the protest. Martinez echoed this characterization and admonished supporters to confine their rhetoric to questions relating to the WSA as an institution. “When we are going down there we are not attacking any individual person; we are attacking the institution as a whole, and it’s very important that we keep our language clear and concise to the institution,” Martinez said. Supporters of Martinez and McCutchen cited bureaucratic inefficiency, prohibitive time-commitments for low-income and work-study students, and a generally hostile environment towards non-WSA members as their three chief grievances. Yael Horowitz ’17, a student who attended the meeting, cited these worries in testimony during the Feb. 22 meeting. Rebecca Hutman ’17, the Chair of the Academic Affairs Committee, acknowledged these complaints. “The long answer is that it wasn’t just about one conversation that went wrong; it was about the fact that the WSA has a fairly long history of bringing in students, soliciting ideas and then when students—especially students from marginalized groups—come forward, often [members of] these groups feel really unsafe in the space that we create,” Hutman said. Around midway through the discussion a straw poll found that 60 students of the attending students were in favor of entirely abolishing the constitution, the WSA’s guiding document, with five opposed and 17 abstaining from voting; likewise, 56 students supported abolishing the by-laws, the 30-page compilation of statutes and regulations concerning parliamentary procedure, while one opposed this and 24 abstained. These polls were informal and non-binding and do not reflect a commitment on the part of the WSA, nor was any such commitment passed at the meeting. Some WSA members, such as Community Committee Chair Lizzie Shackney ’17, expressed regret at the prospect of complete institutional demolition, though she also conceded the existence of serious, systemic shortcomings. Hutman spoke to this point and expressed the need for inclusion and support within the WSA. “If someone comes forward and says ‘I feel unsafe in this space,’ that’s an issue that’s not just that person’s issue, and not just a specific group’s issue; that’s all of our issue,” Hutman said. Indeed, all attendees at the Feb. 22 meeting seemed to agree that the most critical aspect of reform would be including as many voices and perspectives as possible. Martinez expressed his agreement. “I think the problem that [the general assembly] faces is that it’s such a diverse set of things that people deal with that people only really care about one issue and if you could get everybody in the same room that cares about different issues, you’re tackling much more than is being tackled right now,” Martinez said. The exact nature of what reforms ought to take place, the process for instituting them, and the timeframe within which a plan should be developed were all unclear by the end of the meeting. In an interview with The Argus, University President Michael Roth noted that while he respects the autonomy of the WSA as a student-run organization, he is willing to make reform within the Office of Financial Aid in order to support marginalized students. Madison Moore ’16, a WSA member, offered some predictions about the process in the near future. To those like Martinez, McCutchen, and participants in the “Shut. It. Down.” event, Tanenbaum offered hope and a commitment to progressive reforms. “The reason I do this is because I see the laws in this very old institution and they are intransigent; they are deeply rooted; they upset me,” Tanenbaum said. I am a former Assemblyman. What many people may not realize is that the WSA undertakes Constitutional Review at the end of each academic year. It sounds like this one will be more thorough and will attract many more students outside the Assembly itself, which it should. For the sake of ensuring stability and tranquility at Wesleyan, I would once again warn against a complete overhaul of this and other institutions without a framework for the post-hoc system. To apply a geopolitical analogy to this instance, a transitional state provides an ambience wherein the creation of a new government can, to put it mildly, get quite ugly. At this turbulent time, I appreciate the wake-up call given to my peers, many of whom I had the good fortune to serve with from 2012-2014. But the Assembly is not even that old – it has existed since 1975. It succeeded the College Body Senate (founded 1903). I can think of few Wesleyan institutions with more history behind it (that esteemed group includes the Argus). Such longevity attests to the existing framework’s strength and ability to adapt. I therefore believe that reformers should improve longer-existing models, working in concert with their authority and power, than rely solely on new models and young institutions. To start from scratch in a turbulent time would be too much of a risk for the community’s health. This is the definition of a First-World-Problems/progressive-circle-jerk ’round an “institution” that exists primarily to pad resumes, facilitate navel-gazing by students of all stripes and colors, and to serve as target practice for student who went the “feeling” of activism, without any of the risk or . . . yuh know. . . actually doing something.